I study the political sociology of international development and globalization, and most of my research examines the effects of transnational processes and actors on things like foreign aid policies/programs or women's political representation in the developing world. Within this context, my ongoing research looks at: (1) the expansion of the global foreign aid network and its role in the diffusion of world cultural norms and models; (2) the securitization of aid; (3) Canadian foreign aid policy; and (4) the causes and effects of women's political representation in low- and middle-income countries. Some details about my past and present projects are provided below. Liam Swiss. 2018. The Globalization of Foreign Aid: Developing Consensus London: Routledge. Why do aid agencies from wealthy donor countries with diverse domestic political and economic contexts arrive at very similar positions on a wide array of aid policies and priorities? This book suggests that this homogenization of policy represents the effects of common processes of globalization manifest in the aid sector. Drawing on both quantitative and qualitative analysis of policy adoption, the book argues that we need to examine macro-level globalizing influences at the same time as understanding the micro-level social processes at work within aid agencies, in order to adequately explain the so-called ‘emerging global consensus’ that constitutes the globalization of aid. The book explores how global influences on aid agencies in Canada, Sweden, and the United States are mediated through micro-level processes. Using a mixed-methods approach, the book combines cross-national statistical analysis at the global level with two comparative case studies which look at the adoption of common policy priorities in the fields of gender and security. Nilima Gulrajani and Liam Swiss. 2019. "Donor Proliferation to What Ends? New Donor Countries and the Search for Legitimacy." Canadian Journal of Development Studies. doi: 10.1080/02255189.2019.1543652. This article examines the motivations and Donor Countries (NDCs). Drawing on theories performance of New of norm diﬀusion, we argue that an important driver is new donors’ search for legitimacy as advanced and inﬂuential states. A comparison of 26 NDCs with established donors on three metrics of aid levels and quality reveals that NDCs may be adopting the form but not the associated functions and responsibilities of traditional donors. Liam Swiss. 2016. A Sociology of Foreign Aid and the World Society. Sociology Compass. 10(1): 65-73. This article highlights an emerging research agenda for the study of foreign aid through a World Society Theory lens. First, it briefly summarizes the social scientific literature on aid and sociologists’ earlier contributions to this research. Next, it reviews the contours of world society research and the place of aid within this body of literature. Finally, it outlines three emergent threads of research on foreign aid that comprise a new research agenda for the sociology of foreign aid and its role in world society globalization. Liam Swiss. 2012. 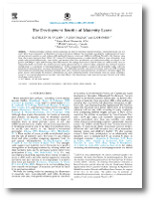 The Adoption of Women and Gender as Development Assistance Priorities: An Event History Analysis of World Polity Effects. International Sociology. 27(1): 96-119. This article quantitatively tests the influence of international organizations, treaties, and United Nations conferences on the adoption of gender policies by foreign aid donor agencies of major Western democracies using cross-national event history analysis. This research demonstrates the extent to which the spread of similar donor institutions and women/gender policies among the OECD donor countries can be explained by world polity influence. Liam Swiss. 2011. Security Sector Reform and Development Assistance: Explaining the Diffusion of Policy Priorities Among Donor Agencies. Qualitative Sociology. 34(2): 371-393. This article examines the recent trend among foreign aid donors to focus on security sector reform as an aid priority using a comparative qualitative case study of aid donors in Canada, Sweden, and the United States. My evidence demonstrates that the extent to which a policy priority with motivations grounded in donor national interest is expressed is mediated by catalytic policy processes linked to intergovernmental organisations and the degree of donor agency autonomy from the rest of government. Liam Swiss. 2017. Foreign Aid Allocation from a Network Perspective: The Effect of Global Ties. Social Science Research 63: 111-123. This article examines competing explanations for foreign aid allocation on the global level and argues for a new approach to understanding aid from an institutionalist perspective. Using network data on all official bilateral aid relationships between countries in the period from 1975 through 2006 and data on recipient country ties to world society, the article offers an alternative explanation for the allocation of global foreign aid. Fixed effects negative binomial regression models on a panel sample of 117 developing countries reveal that global ties to world society in the form of non-governmental memberships and treaty ratifications are strong determinants of the network centrality of recipient countries in the global foreign aid network. Liam Swiss. 2016. World Society and the Global Foreign Aid Network. Sociology of Development. 2 (4): 342-374. This article analyzes the relationship between foreign aid and globalization to explain developing country ties to world society and argues that foreign aid can be viewed as a recursive mechanism through which donor states refine and spread international norms and organizational ties. Using network data on foreign aid relationships between countries this article analyzes the effects of aid on human rights treaty ratification and international organization memberships in a sample of 135 less developed countries from the period of 1975-2008. Results of random effects panel regression models show that increased aid network centrality brokers increased country ties to world society, supporting a novel interpretation of foreign aid as a transnational process of political globalization. Liam Swiss and Wesley Longhofer. 2016. Membership has its privileges: Shared international organizational affiliation and foreign aid flows, 1978-2010. Social Forces. 94 (4): 1769-1793. This paper examines the relationship between shared organizational memberships and bilateral aid flows between donor and recipient countries from 1978 to 2010. We propose that joint membership in international nongovernmental organizations (INGOs) and intergovernmental organizations (IGOs) facilitates aid flows from donor to recipient. However, we also suggest this relationship is contingent upon the level of development in the recipient country. Results from a multi-stage analysis of more than 61,000 donor-recipient dyads show that while shared memberships strongly increase the likelihood of an aid relationship between countries, they tend to predict increased volumes of aid only for recipient countries at the lowest levels of development as measured by GDP. Liam Swiss. 2015. Space for Gender Equality in the Security and Development Agenda? Insights from Three Donors. pp. 188-211 in Stephen Brown & Jörn Grävingholt, eds. The Securitization of Foreign Aid. London: Palgrave-Macmillan. How has the manner in which the aid securitization agenda has evolved and been shaped by donors to provide a new policy model in development assistance contributed to possible neglect of gender and other issues? What role is there for civil society and international organisations to attempt to reinsert gender within the security and development agenda? Drawing on in-depth interviews with donor officials and civil society representatives in Canada, Sweden, and the United States this paper highlights the primary reasons gender is being neglected in the emerging donor security agenda. Liam Swiss. 2012. Gender, Security, and Instrumentalism: Canada's Foreign Aid in Support of National Interest? pp. 135-158 in Stephen Brown, ed. Struggling for Effectiveness: CIDA and Canadian Aid Policy. Montreal: McGill-Queen's University Press. This chapter examines the impact of the securitization of Canadian aid to see how this trend has affected the overall delivery of ODA by CIDA and other Canadian stakeholders. Results demonstrate how the securitization of aid reflects a shift towards instrumentalization of aid in a way that has undermined Canada's focus on development priorities more closely related to poverty reduction and humanitarian concerns, such as gender equality. Stephen Brown and Liam Swiss. 2017. 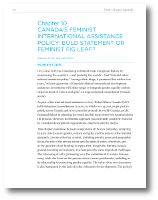 "Canada's Feminist International Assistance Policy: Game-Changer or Fig Leaf?" Pp. 117-31 in How Ottawa Spends, 2017-2018, edited by K. A. H. Graham and A. M. Maslove. Ottawa: School of Public Policy and Administration, Carleton University. This chapter examines the main components of the new aid policy, analyzing in turn 1) its focus on gender, women and girls, and the nature of the feminist approach; 2) some other key content, including priority areas and geographic focus, the role of the private sector and the issue of policy coherence; and 3) the question of aid funding. It argues that, though the feminist focus is ground-breaking and welcome, it is hampered by some important challenges. Liam Swiss and Jessica Barry. 2017. "Did Changes in Official Language Lead to Spending Shifts?" Pp. 23-48 in Obligations and Omissions: Canada’s Ambiguous Actions on Gender Equality, edited by R. Tiessen and S. Baranyi. Montréal: McGill-Queen's University Press. This chapter analyzes the former CIDA’s Open Data Historical Project Data Set and International Aid Transparency Initiative Data Set to examine the trends in spending on gender equality by Canada in the period from 2005 to 2014. Using a sample of over 240,000 project transactions during this period and comparing CIDA’s gender equality marker coding to Development Assistance Committee (DAC) gender coding sources, this chapter examines whether the Harper-era discursive shift away from gender equality was associated with any notable shift in spending on gender equality by Canada. Liam Swiss and Stephen Brown. 2015. The Aid Orphan Myth. Third World Quarterly 36(2): 240-256. This paper unpacks the concept of aid orphans - those countries in receipt of little or no foreign aid. It reviews the various definitions of aid orphans in the literature, considers the salience of orphans to aid policy and practice, and conducts an empirical analysis using OECD DAC data of possible aid orphan countries according to criteria drawn from the aid literature. This chapter examines the intersection of the complex motivations that underpin Canadian aid and addresses the following questions: What effects have factors like human rights, democracy, poverty, gender inequality, trade, and resource extraction had on shaping Canadian aid flows? What other donors does Canada most closely resemble in how it patterns its aid allocation? How does the influence of other donors and international norms interact with the priorities of different Canadian governments over time? Drawing upon fifty years of data on Canadian bilateral Official Development Assistance (ODA), this paper uses an exploratory longitudinal analysis to provide evidence in response to these questions in an effort to better contextualize the shifting motivations for Canadian aid over the past fifty years. Robert C. Jones and Liam Swiss. 2014. Gendered Leadership: The Effects of Female Development Agency Leaders on Foreign Aid Spending. Sociological Forum. 29(3): 571-586. This paper examines the effects of gendered leadership using a case study of foreign aid agencies and their allocation of spending toward gender-related programming. Drawing upon data on aid flows and agency leadership within the major western aid donors of the OECD DAC from 1995 through 2009, the paper uses pooled time series analysis to reveal a tendency for female DGs and ministers to focus on gender-mainstreamed program spending, while male DGs focus on gender-focused programs. Stephen Brown and Liam Swiss. 2013. The Hollow Ring of Donor Commitment: Country Concentration and the Decoupling of Aid Effectiveness Norms from Donor Practice. Development Policy Review 31(6): 737-755. This paper presents a genealogy of the emerging norm of country concentration in relation to the aid effectiveness agenda, analyses its rationale as a tool of aid effectiveness, and determines using newly available aid network data to what extent DAC donors have modified their practices in accordance with the new norm. The paper points to the pervasive decoupling of the aid effectiveness norm of concentration from donor practice. Liam Swiss. 2010. A New National Project for Canadian Development Cooperation. Policy paper commissioned by the Walter & Duncan Gordon Foundation. Prepared in collaboration with Simon Maxwell of the Overseas Development Institute (UK), this policy paper was commissioned by the Walter & Duncan Gordon Foundation as part of a larger project to re-imagine the delivery of Canadian foreign aid. 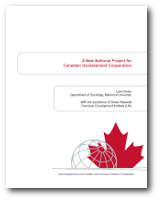 The paper outlines reforms to Canadian international development cooperation in light f a set of recent global drivers of change which are reshaping the development agenda internationally. Kathleen M. Fallon, Alissa Mazar and Liam Swiss. 2017. "The Development Benefits of Maternity Leave." World Development. 96:102-18. This article examines the social development benefits of maternity leave policies in low- and middle-income countries. It shows that maternity leaves are associated with reduced infant and child mortality rates, as well as reduced fertility rates. Further, maternity leave provisions decrease fertility and infant/child mortality rates most in countries with lower GDP per capita and countries with middle-range secondary enrollment rates. Liam Swiss and Kathleen M. Fallon. 2017. Women's Transnational Activism, Norm Cascades, and Quota Adoption in The Developing World. Politics and Gender 13(3): 458-487. This article analyzes quota adoption in 134 developing countries from 1987 to 2012, focusing on quota type, transnational activism, and norm cascades. Results provide new evidence of how quota adoption processes differ according to quota type, the central role played by participation in Beijing 95, and how increased global counts contribute to faster nonparty quota adoption while increased neighboring country counts lead to faster to party quota adoption. Miriam J. Anderson and Liam Swiss. 2014. Peace Accords and the Adoption of Electoral Quotas for Women in the Developing World, 1990-2006. Politics and Gender 10(1): 33-61. This paper employs event history modeling on a sample of 115 developing countries in the period from 1990 to 2006 to examine the effect of peace accords with specific clauses addressing women's rights and gender equality on the adoption of electoral quotas for women. Findings point to the important role played by post-conflict peace accords with women's rights provisions in promoting the adoption of electoral quotas for women. Liam Swiss, Kathleen M. Fallon, and Giovani Burgos. 2012. Does Critical Mass Matter? Women's Political Representation and Child Health in Developing Countries. Social Forces. 91(2): 531-558. Pooled cross-sectional times series analysis of the relationship of women's political representation and democratization to child health development indicators in the developing world over the period 1980 to 2005. Uses a sample of 102 countries to demonstrate a connection between increased women's representation and improved immunization and child survival rates. Kathleen M. Fallon, Liam Swiss, and Jocelyn Viterna. 2012. Resolving the Democracy Paradox: Democratization and Women's Legislative Representation in Developing Nations, 1975 to 2009. American Sociological Review. 77(3): 380-408. This artilce employse pooled cross-sectional time series models to analyse the impact of democratization on the election of women to parliament in 118 developing countries from 1975-2009. Liam Swiss. 2009. Decoupling Values from Action: An Event-History Analysis of the Election of Women in the Developing World 1945-1990. International Journal of Comparative Sociology. 50(1): 69-95. This article examines the effects of world polity influences on the election of the first woman to parliament in a cross-section of 92 countries from the developing world. The articlemakes an important contribution to the world polity theory literature by quantitatively explaining policy decoupling and demonstrating the influence of world society on the decoupling phenomenon. Liam Swiss. 2018. Review of Ann Swidler and Susan Cott Watkins, A Fraught Embrace The Romance and Reality of AIDS Altruism in Africa. American Journal of Sociology. 123, no. 6 (May 2018): 1844-1846. Yujiro Sano, Lisa Kaida, and Liam Swiss. 2017. Earnings of Immigrants in Traditional and Non-Traditional Destinations: A Case Study from Atlantic Canada. Journal of International Migration and Integration. 18(3), 961-980. Rose Ricciardelli, Hayley Crichton, Liam Swiss, Dale C. Spencer and Micheal Adorjan. 2017. "From Knowledge to Action? The Youth Criminal Justice Act and Use of Extrajudicial Measures in Youth Policing." Police Practice and Research. 18(6):599-611. Mark C.J. Stoddart, Liam Swiss, Nicole Power and Lawrence F. Felt. 2016. "Taking Care of Companion Animals: Institutional Policies and Practices in Newfoundland and Labrador." Society & Animals. 24(5):423-44. Liam Swiss. 2014. Globalization and Social Change. pp. 299-317 in Lorne Tepperman, Patrizia Albanese, and James Curtis, eds. Principles of Sociology: Canadian Perspectives. (3rd ed.) Toronto: Oxford University Press. Céline Le Bourdais, Magali Girard, Liam Swiss, and Évelyn Lapierre-Adamcyk. 2014. Entre famille et vieillissement : Impact des transformations familiales aux âges avancés. International Journal of Canadian Studies. 47: 9-40. Liam Swiss and Céline Le Bourdais. 2009. Father-Child Contact after Separation: The Influence of Living Arrangements. Journal of Family Issues. 30 (5): 623-652. Liam Swiss. 2009. Review of Jackie Smith, Social Movements for Global Democracy. Canadian Journal of Sociology. 34, (2): 520-522. "Minister of International Development and Multitasking?" The McLeod Group Blog. April 4, 2019. "Feminism on the Cheap: Can Canada Achieve its Ambitious Gender Equality Aid Targets with No New Money?" GrOW Research Bulletin. No. 5. February, 2018. "How to spend foreign aid like a feminist" The Conversation. July 3, 2017. "Do Maternity Leave Benefits Improve Economic and Social Development in Developing Countries?" with Kathleen M. Fallon and Alissa Mazar. Sociological Insights for Development Policy. ASA Section of Development Sociology. vol. 2, no. 4, June 16, 2017. "3 Ways New Donors are Different and Why it Matters" Development Unplugged Blog. Huffington Post. June 19, 2017. "Opaque Transparency in Canada's Foreign Aid" with Stephen Brown. The McLeod Group Blog. June 30, 2016. "Canada Should Act To Facilitate And Amplify Remittances". Development Unplugged Blog. Huffington Post. March 2, 2016. "Canada Balancing Budget on Backs of World’s Poorest". The McLeod Group Blog. April 22, 2015. "Tory war on evidence claims another casualty" with John McLevey. Toronto Star. p. A15. September 24, 2014. "Canadian Foreign Aid in Support of Women, Peace and Security 2011‐2013" p. 9-13 in Worth the Wait? Reflections on Canada’s National Action Plan & Reports on Women, Peace & Security. Women, Peace, and Security Network - Canada, Ottawa, ON, May 8, 2014. "Beyond the Echo Chamber" OpenCanada.org Canadian International Council, Ottawa, ON. August 1, 2013. "Fragmentation or Concentration in an Era of Aid Decline?" International Development in a Changing World Series. North-South Institute, Ottawa, ON. October 31, 2012. Until it closed in May 2014 I occasionally posted commentary and analysis to the Ottawa Citizen Aid and Development blog. Click the link at right to access these posts now archived on this site.